In Hungary, the headline news was that title contender Lewis Hamilton gave up three points in his battle with Ferrari's Sebastian Vettel by voluntarily handing a place to his teammate. But that teammate was Bottas, who qualified ahead of the sister Mercedes in Hungary, has won twice in 2017, and is now just 19 points behind Hamilton in the drivers' standings. "Not every teammate would have done that for a podium, but on the other hand, I would have been angry if Lewis had not accepted the deal. "The team has made it clear right from the beginning that we are both treated and respected equally," he told Sport Bild. "We get the same equipment, there is no number 1 and number 2 driver, and I trusted that was the case. I am fighting for the world championship, as this is also about my own career. "I do not want to be in Lewis' shadow," the quiet 27-year-old insisted. 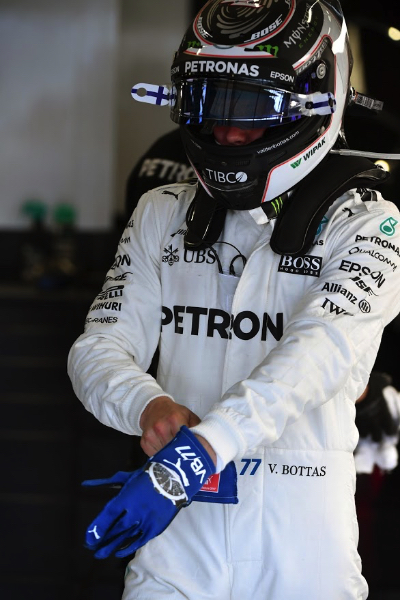 When asked if he really thinks he can win this year's title, Bottas answered: "Yes. I can become world champion. "There are still nine races to go, and I believe that I can beat Lewis and Sebastian -- I have already done both this year. "I am getting better and better. There is no limit for me," he added. "I would never say that one of my opponents is better than me. I believe in myself." However, it is true that Mercedes is yet to sign him up beyond November's Abu Dhabi finale, but Bottas insisted: "This has also been the case for me every year. "At this time of the year I often did not know how it would go on for me, so I have a lot of practice," he smiled. "And it's ok, as I feel comfortable in the team and have only received positive feedback. So I'm not too worried."